Why settle for mediocrity? Leap forward into SkyTech Archangel AMD series with the newest architectures from AMD Ryzen CPU and Radeon Graphic card. Powered by AMD Ryzen 2600 Chipset, this 6-core processor delivers great performance with a base speed of 3.4 Ghz and max boost of 3.9 GHz. SkyTech Archangel delivers the best price performance value gaming rig in the market.The SkyTech Archangel offers the best computer built up to date with the AMD Ryzen 2600 Processor and AMD Radeon RX 580 4G Graphic Card that can easily run any VR Oculus Rift/HTC Vive . The RX 580 4G is capable to run any games in the market at high & ultra 1080P setting with jaw dropping fps. This powerful PC equips with blazing fast 500G SSD that can boost the computer up within seconds. In conclusion, you must see the system yourselves to appreciate the beauty & quality that SkyTech designs. Pros: Very good parts for the price. I can't stress that enough. No bloatware. just windows 10 as promised. Great cable management by skytech. Very clean look inside. I've heard this Thermaltake case is not super easy to work with. It plays new games on high-quality settings with decent results. It probably wont push 4k, but it runs games on 1080p quite well. It will probably be a few years before games' requirements demand more than the computer can handle as is. But the motherboard is pretty decent so there's some room for upgrades. quiet when the DVD drive isnt in use. Cons: If you use it for gaming you will probably want to buy more RAM. 8Gb will do, for now but you'll want to upgrade in the near future. Especially if you like to run programs in the background (Dischord, skype, Chrome, recording software, etc.) while playing games. Im not the biggest fan of the case, as the airflow seems dubious. But it doesnt seem to run hot so i guess it's not a problem. Other Thoughts: I dont use this for VR at all, so I wouldnt know how good it is at VR. I'd imagine it would offer an enjoyable middle-of-the-road performance at the very least. Im very pleased with this product so far. Would buy from skytech again. Cons: There weren't any cons that appeared once I received the PC. Everything worked perfectly fine and had no trouble when starting up the PC. Other Thoughts: If you're ever looking for a PC but don't want to spend in the $1,000's, you should definitely put this as your next thing to get! The only thing I'd recommend is to get a mechanical keyboard. The keyboard that it arrives with is fine, but it would be better to get a mechanical keyboard because you'll have a long-lasting keyboard and better performance. Pros: I bought this for gaming for my teen and for my photography/art. I am not disappointed. It is super fast; when I restart it, it takes less than a minute. My teen plays games effortlessly, but they are games like Portal and Fallout---no Fortnite etc. in case you're curious as to how new games play out. Great graphics. I love having a computer with an SSD also. What a difference from past computers (brand name ones, too). It is so quiet and we love the blue lights, though I let it sleep every night. Great investment so far. Cons: I do NOT like Win 10. We use it already at work and we don't like it there, either. I preferred Win 7 despite knowing its last updates are next year. But this came with Win 10. I had to buy a DVI-D to HDMI cable, as my old monitor (an HP) would not work without an adapter. The motherboard is bypassed and you have to hook up to the graphics card port for the monitor to show, so I had to buy it. I also bought an external dvd/cd player for it although it has a bay that works when I try it---haven't tried either way yet. |I had to call and find out what adapter I needed; Customer service at Newegg is great and friendly, and they make sure they answer your tech questions or find you someone who can. They directed me to Archangel and I finally got the adapter needed, locally. |I would have bought it from Newegg had I known it needed one when buying the Archangel. Other Thoughts: I am not a tech person, but this computer is working well for us so far. I am still tweaking this and that for our own personal use despite Win 10. It takes a little longer to do this, as we have win 10 at work also, but "tweaking" it is blocked of course. At $599, I bought this at a great price |(caught the sale) for it being our first gaming computer. Pros: Arrived in just 2 business days. It was extremely easy to set up. Can’t beat the preformance at this price. I mainly play War Thunder and I run it on “Movie” graphic settings. This is the highest quality settings available in the game. I tuned the settings slightly by turning down some of the useless settings. The game runs great and I get a consistent 110 fps for ground forces battles and 200+ consistently for air battles. I have played a few other games as well with equally as good results. This computer is everything I was looking for and I couldn’t be happier. I have it in my room and use the wireless WiFi adapters that comes with it and have had no problems. The case is pretty good looking and I have no complaints there. Cons: Many people complain that the keyboard and mouse are bad. I don’t find them to be all that bad, but they are noticeable cheap. I personally don’t consider this much of a con since they did come with the rest of the pc. Quality gaming mouse and keyboards are not all that expensive to upgrade to and many people already have their own. I have had no problems with them and I don’t mind at all. They work fine for me. Other Thoughts: 10/10 would recommend this computer to anyone as an intro gaming computer. 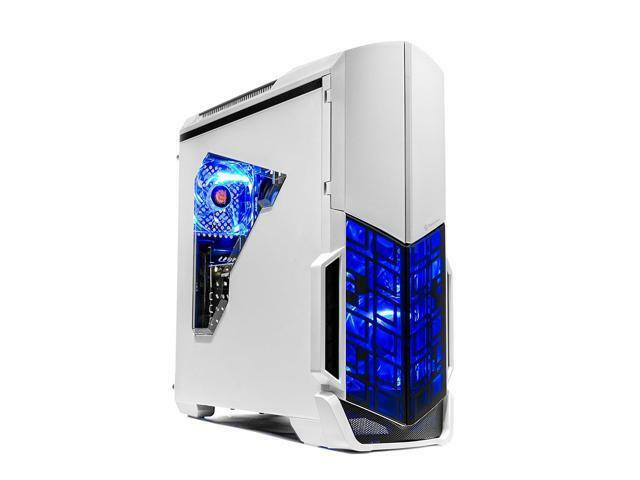 Really can’t beat the price for a pre built gaming pc as long as it is on sale. Even when it is not on sale I still believe it’s a reasonable price. I individually researched the price of all the components if I were to build it myself and it more or less matched the price I payed. I am extremely happy with this purchase. Cons: Seems to not have windows installed even though the box says windows comes with it. Also did not come with thr AMD promo items. Pros: It's very fast setting up. It only took maybe 2 min's tops to set up after that it is as fast as greased lighting and runs as smooth as silk. Pros: -Quick setup right out of the box, upgraded from an old Dell with an i3 processor. Like entering a whole new world. -Extremely tight cables inside. Took a lot of effort to add second hard drive. Not a huge "con" as it makes the inside of the case much cleaner and less cluttered. -Keyboard is a bit of a joke. Using my own. Mouse seems okay, but I already had a better one of these to use as well. Other Thoughts: I haven't upgraded my computer since 2011 (old Dell with i3, DDR3 ram, and Radeon 6800), so I was way beyond needing something newer. This thing is exactly what I needed. Amazing how much faster the SSD is compared to my old HDD. I haven't been a huge PC gamer since the old CS 1.6 days, so I can't comment much on how this machine will handle today's games; however, I installed Apex Legends and it seems to run perfectly smooth at 1080p on a mix of medium & high settings. FPS goes way up when settings are dialed back to low. I will probably add more RAM in the near future. Additional FYI...the motherboard it came with is an ASRock, the RAM was Team Group (?) DDR4 2400. Only 2 RAM slots on the motherboard. WiFi is a separate card which uses a slot on the motherboard. Cons: -Case arrived with a large number of scratches and scuffs, once of the WiFi antenna arrived out of it's packaging (loose in the box). Other Thoughts: -A disclaimer, I have only used the computer for an evening, but so far everything seems to be running smoothly. Computer was easy to and seems to run quickly. I tried a few games on it (Blood Bowl 2, MTG Arena) and both games ran smoothly. Arena ran great on Ultra settings. Newegg shipped quickly, and quickly refunded me $80 when the system went on sale the day after I bought it. Issues with this computer come from the case: It was wrapped up as new, but there were a number of scratches and scuffs on it. Case feels cheap, as does the mouse (although the mouse isn't really an issue for me, it works fine). All in all, I'm happy with the computer, but buying something as "new" and then receiving it with a bunch of scuffs and scratches leaves you with a case of the "feels bads." Wouldn't be happy if this happened with a new car, not happy that it happened with my new computer.